Over the years quite a few trawlers and cruisers have been built in Taiwan. Some of the better ones are made by a company called Symbol. Founded in 1982, Symbol is still in business today, producing boats from 42 feet to luxury yachts. Our used boat find is a 1988 Sundeck Aft Cabin. The lines of the Symbol 44 are classic 80s. She has a style shared with other builders such as Ocean Alexander. Boarding aft you can access the lower helm via a sliding pilothouse door or climb the three steps to the enclosed aft deck. 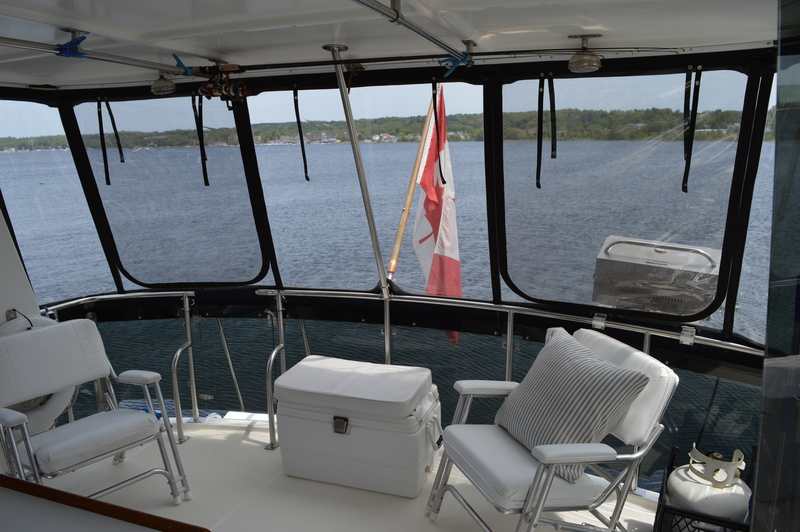 Protected by a hard top, Plexiglas wing doors and full enclosure with screens, the aft deck is ultimately usable and enjoyable. Forward and centre is the refreshment centre complete with sink and icemaker. Moulded stairs lead to the bridge protected by full canvas. The centred helm provides great sightlines forward and while docking. 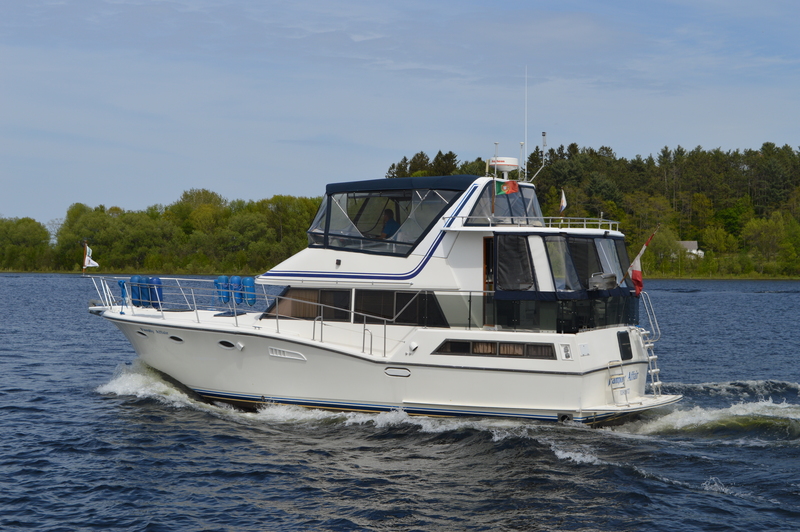 Built for long range cruising, this 44 AC is well equipped for the task with a mix of older and newer electronics. All you have to do is look around the spacious salon at all of the teak work and joinery to know that this Symbol has classic Taiwanese roots. While checking out the salon it is evident that this motor yacht has been well cared for. The salon furnishings are original and still functional, however there is plenty of space to introduce new fittings for more comfort and a new look. 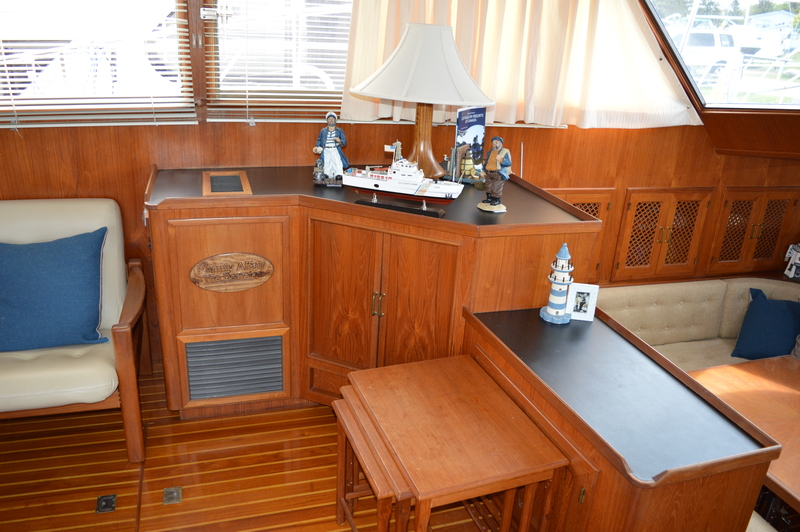 While the teak is dark, the large cabin windows brighten up the interior significantly. Teak cabinets provide more than average storage. The space taken up by the TV can easily be adapted to hold a new entertainment system. Forward to port is the lower helm station. With its teak console and ship’s wheel it is almost a work of art. Devoid of electronics, this station does have a complete set of instruments for the Inveco/Fiat diesels. The helm is also a convenient location for the AC and DC electrical panels. While docking, the sliding door is truly convenient. Multiple hatch panels in the salon sole open up the engine room to access the diesels, Onan generator and other systems. 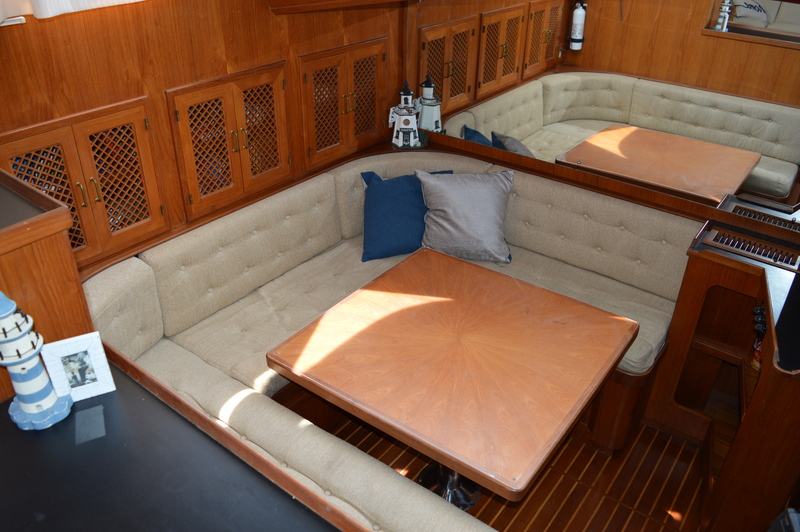 Befitting a 44-foot yacht the Symbol’s dinette down layout is spacious and comfortable. A truly over-engineered pedestal raises and lowers the table to access the storage in the dinette or for conversion to a berth. The galley opposite is equipped with a Princess range and oven, ample counter space with double sink, new microwave, and a ¾ refrigerator freezer. Forward is the guest cabin, set up with a single upper berth and a lower double berth. Opening ports, ample lighting, an overhead hatch and mirrored bulkhead brighten up the cabin. A seat for dressing, drawers and a hanging locker round out the amenities. The guest head has separate spaces for the head and vanity and shower stall. With the 44’s 15-foot beam, the owners enjoy true live aboard accommodations. 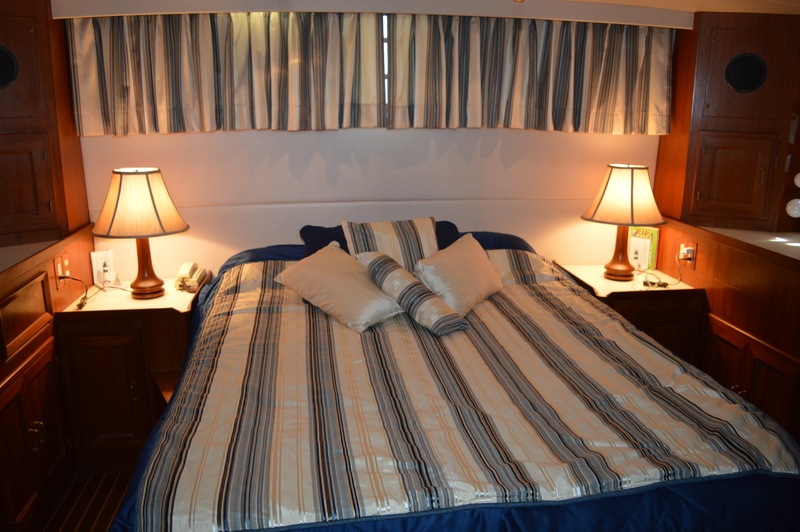 The queen berth is flanked by built in nightstands, sets of drawers and hanging lockers, counter space and a dressing table and mirror. Extra large cabin windows in the hull sides and transom allow for fresh air and sunlight. There is a private owner’s head with a large vanity, head and separate shower stall. Symbol was the first production builder of planing hulls in Taiwan. Even so, with an overall length of 52 feet, a beam of 15 feet and a displacement of 38,000 lbs she is not a fast boat. At 1,000 to 1,200 rpm she cruises at seven plus knots efficiently. At 1,500 rpm, she’s up to 10 knots and a fast cruise is 12.5 knots at 2,000. Pushed to the max of 2,600 to outrun weather she tops out at 15 knots. What surprised me is how well this Symbol responded to the helm thanks to large rudders with plenty of movement. While you won’t find many Symbols on the used market in Canada, when you do locate one it can be a really great find. The interior woodwork is first rate, but what really makes it special, is the classic look and the creature comforts found in a cruiser like this. This boat is featured in the Summer 2016 issue of Boats&Places. Mike Gridley is a Producer and Host of PowerBoat Television and contributor to Boats&Places Magazine, BoatTest.ca and BoaterNews.ca. A lifelong boater, Mike started on the water with a 12-foot Peterborough cedar strip. Graduating to fibreglass, he has owned a series of boats from cuddy cabins to cruisers. He has come full circle back to wood with the purchase of a 1964 Greavette. After graduating from Ryerson University, Mike joined Molson Breweries where he spent 17 years in a variety of sales, marketing and promotions positions. He went on to hone his marketing communications, creative and advertising skills as a Senior Account Director with several national advertising agencies for clients including Bank of Montreal, Petro-Canada, Canadian Tire and Polaroid. In pursuit of his love of all things boating, Mike joined Lifestyle Integrated in 2004 and assumed the role of Producer in 2006. Get your Discover Cruising DVD at our webstore today!